What is an accurate way to evaluate chess positions? I've been interested for a while about a computer chess AI algorithms (and got the chance to work on one at some point) like Minimax, and as the core component of these algorithms is the so-called evaluation function to determine what is a good board configuration, and what is a bad one. In other terms, given a configuration of your Chess board, how do you determine that it is to your advantage, and with what degree of confidence? If you own the center, this is rather favorable. If you have more pieces than your opponent, this is rather favorable. If you lost your Queen, this is rather not favorable. If you have a pawn that is close to being promoted this is favorable. So I would like to ask for some advice on how to create a good evaluation function, based on some expert knowledge about the Chess game in general. And if possible, a degree of favorability (say between 1 being very not favorable, to 100 being extremely favorable). The idea in the end is to be able to create an algorithm that will look in the tree of possibilities up to a certain depth and evaluate what the most favorable configuration for next move is (taking into account several moves in the future) based on what is favorable to the player and not favorable to the opponent. But without a good evaluation function the algorithm is nothing. Here's a good starting point. Material comparison is key (and easy), then you can tune that to consider positional aspects like open ranks/files/diagonals, pawn structure, etc. Adding up to the answer by @Wes Freeman, I would suggest looking up how does the best computer engine in the world, Stockfish, evaluate a given position. As the source code is open, you can do it for free. I think the file with the evaluation function you are looking for is this one. This answer may have been long, late and off-topic, but I hope it was helpful anyways. 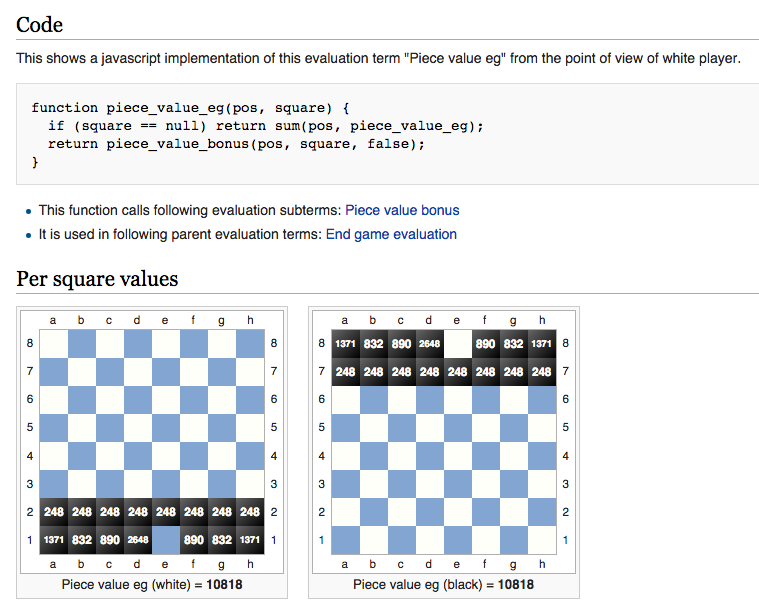 I think chess programmers tend not to rely on the knowledge of strong chess players when designing their evaluation functions, but instead try out different elements, and then test them in games against other engines, and decide what to keep. Larry Kaufman talks a fair bit about his views on what a human's understanding is, but it sounds like both Rajlich and Dailey were very results oriented, and did not adopt Kaufman's ideas wholesale. One article I found interesting was Zach Wegner comparing the evaluation functions of Rybka and Fruit. One of the areas where Rybka may have represented a step forward was in its incorporation of material imbalance tables based on specific combinations of pieces. Kaufman wrote an article on this as well. This link is the best starting point IMHO. I am using this as my starting point for my own chess program & finding it simple to understand and useful too. Then repeat Steps 3 and 4 until you've reached your goal for performance. The usual approach to doing this is to set up a laboratory where engines face off in engine tournaments. Multiple games are used in which the engine plays both colors. The main tournaments of interest involve running an engine with parameter value set A against the same engine with parameter value set B. This approach also consumes a lot of time. A more recent (and innovative approach) was developed in 2010 by researchers using Genetic Algorithm techniques to a) specify the parameters, and b) tune the parameter values. The investigators first ran an engine with a starting, nominal set of parameter values against a set of grandmaster games to see if it could effectively choose the "best move". The "best move" was defined as the move the grandmaster made*. Wherever it failed to do so was recorded. Then, another parameter value set was tried, and relative performance vs the prior run determined. Only after engine parameters have been found that can mimic a GM reasonably well does the actual engine tournament phase begin. In this phase, different parameter value sets are once again pitted against each other, this time directly. Genetic Algorithm improvement techniques are applied to generate successively better generations of the engine. In this research project, 36 parameters were used, including all of the material values of the pieces, and many of the more common strategic evaluation criteria, such as backward pawns, weak squares, bishop pair, and so on. However, the researchers added some new parameters, such as "king pressure", "mobility" values for each kind of piece, rook on a file adjacent to the king, rook on a semi-open file, rook attacking the king on the a-/b-/g-/h-file, separation between a passed pawn and the defending king, and more. Unfortunately, the researchers don't elaborate on how they came up with this suite of parameters, and what alternate parameters they may have tested and rejected. It would be reasonable to assume that they began with a much larger set, and determined (through trial and error) which ones had the greatest effect on performance, and which ones were either insignificant or derivative, and so could be dropped. If this sounds like it might be useful, you can find the research here. Readers may be quite surprised to see the number of question marks that adorn the games in this book. Surely, you might think, with just thirty games to select, it should have been easy to find some sound games. However, I can assure you that it was not. ... it is possible to find fault with virtually any complex, hard-fought game... I have never felt that my play was anywhere near completely accurate, so I personally don't find these revelations distressing. However, some may find it hard to admit that chess as played by human beings is less accurate than previously thought. The point that Dr Nunn raises suggests that the researchers' initial approach to setting the engine parameters by requiring them to imitate grandmaster moves may be flawed because human play is flawed. In fact, it's well established that engines already play better than humans. Therefore, perhaps a better approach to setting the initial parameters would be to match a new engine against a superior existing engine. It gives you an introduction on how the Stockfish functions work. Not the answer you're looking for? Browse other questions tagged engines positional-play evaluation chess-algorithms or ask your own question. Why do chess engines sometimes miss good moves (or take forever to spot)? How to create your own opening book for your own chess engine? Simplest chess engine to reach 2000 ELO? What is the optimal way to use Stockfish programmatically? How do you implement Alpha-Beta search when you can only compare 2 positions to each other? What does the sign of the score represent in chess engines? How do engines evaluate a position (actual algorithm)? Why might this supervised engine make mistakes based on an example game?